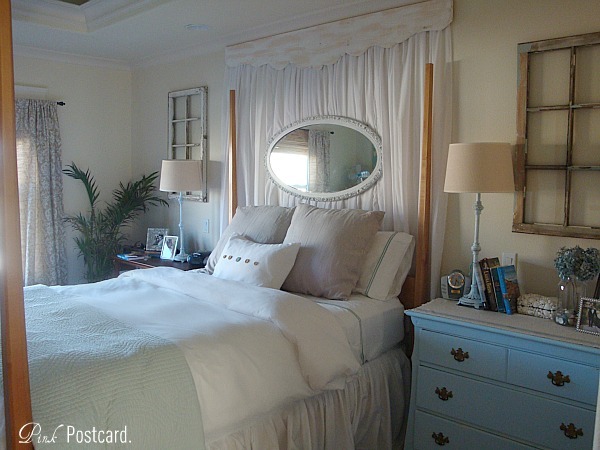 romantic blue and white beachy bedroom- reveal! My goodness- this has been one long, drawn out project!! For some of you, it may seem like this just started, but it was actually one of my very first projects here on this lil 'ol blog. I don't doubt that there will be additions and changes over time, but we are really (finally) enjoying this room. We've had varying shades of red since we were married, and we were ready to move on. 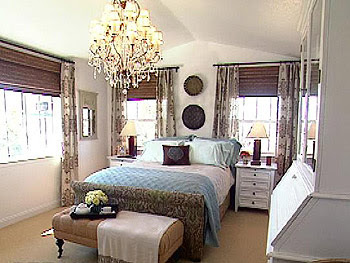 A few years ago, I saw a room Nate Berkus did on Oprah, and absolutely loved it. As in, I saved it on the DVR forever so I could keep going back to look at it! We started to make changes to the bedroom, and there were elements that were ok, but it really fell short of a more sophisticated look that I was going for. It felt....juvenile. Kind of embarrassing, but also worthwhile to see how I'm growing in my photography skills, and decorating taste / style. 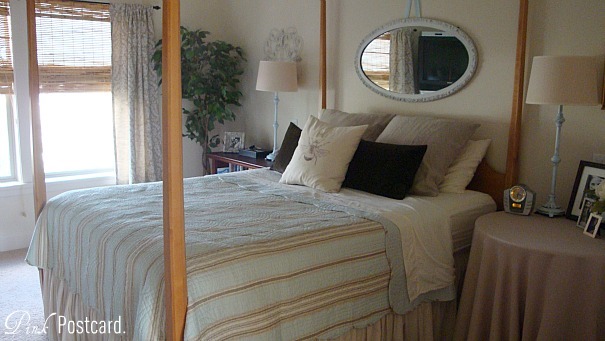 I liked the color of the quilt, and the beachy feel it offered, but we missed the comfy squishiness of a down comforter. We're just not quilt people. Everything in this room was purchased at discount, handmade, or thrifted. 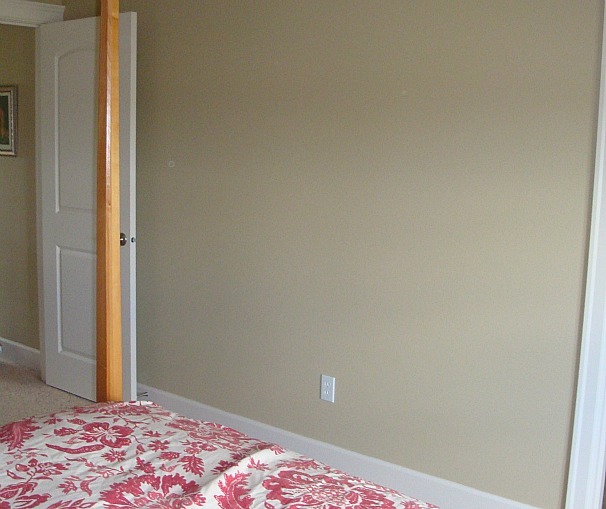 I finally came up with a solution that I am loving for the fabric wall- a curvy cornice! I cut this out from a piece of pine, dry brushed it in white chalk paint and sanded off bits. I think it has the finished look I was missing. The chippy windows. Love the texture and vintage feel they bring to the room. 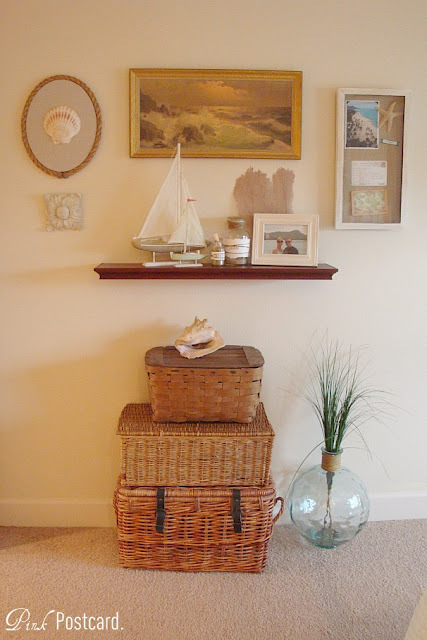 The baskets are an inexpensive wall filler for now. I'm hoping to add some canvas art from some family photos here in the future. 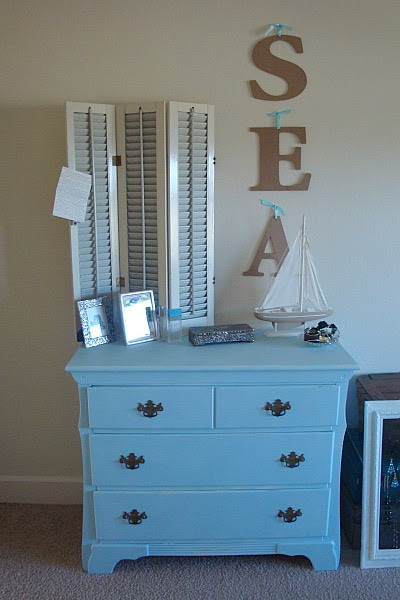 The large wall next to the doors of the bedroom now has a mix of vintage and new items for a beachy vignette. 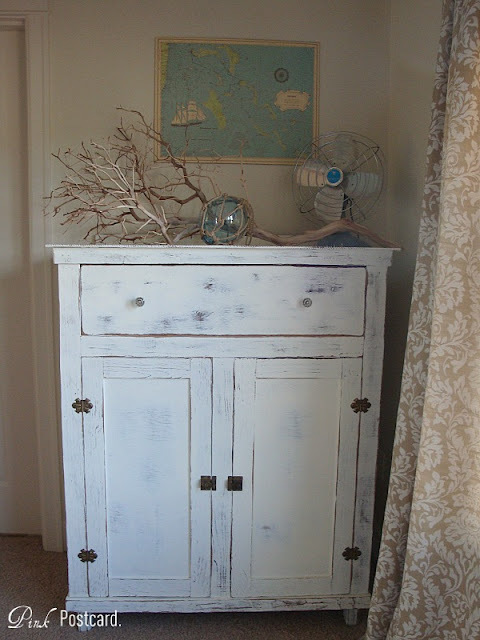 We traded in a traditional dresser for this vintage cabinet that I painted in a soft white and distressed. The large manzanita branch is something I looked for a long time. I picked this up at a flea market during Christmas! The map above the cabinet was a recent find on Etsy, from Bella Rose Signature. 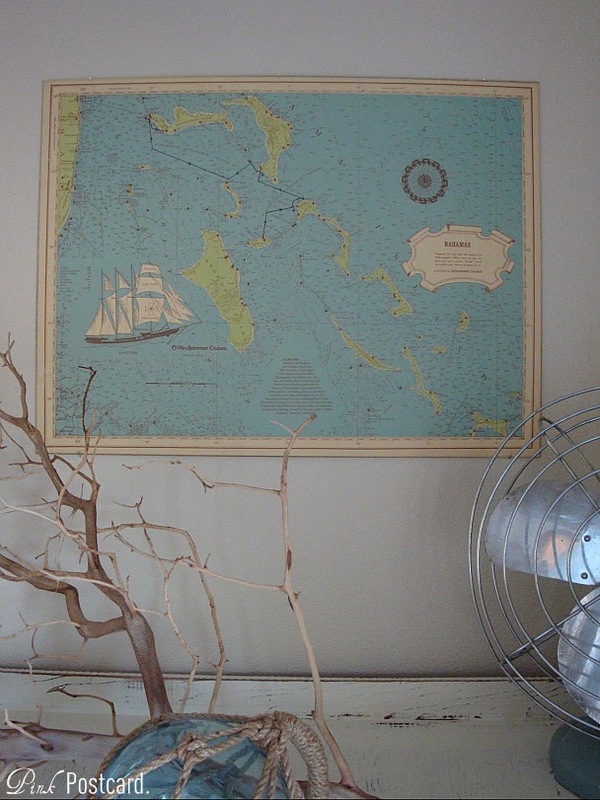 It's a vintage Bahamas map. I loved the ship on it and the idea of warm sunny beaches. and replaced it with a living palm. The bedding was all very affordable. The sheets look very Pottery Barn, but they are from Target. We absolutely love them. I got them for $30 (with a coupon) and they are so soft. Normally, I think they are only $50? so not a bad price anyway! The little accent pillow came with the duvet cover. I simply sewed some decorative buttons on it. The duvet cover was also an amazing deal from Target. I just love how it finally came together. The room feels closer to my inspiration pic. I wasn't going for an exact copy of Nate's room, but more of the overall feel. Light and bright, beachy romantic touches, and some vintage furnishings thrown into the mix. If I missed something, or you have other questions, feel free to ask! Thanks for letting me share this transformation with you! This looks soft and dreamy! The little pillow with the buttons are a nice touch. And the cornice is perfect...adds a classy, finished look! You did a great job! its gorgeous!! I love the colors! looks really nice! love the color scheme and the old windows fit there perfectly. i want to say that you have done well. i remember the posts as the bedroom started growing and changing. i will definitely say you have hit your stride. love it--all the elements tie so well together. congrats on a beautiful bedroom. Beautiful! I love seeing how the room evolved. Thanks for giving a breakdown of where things were purchased! Oh Denise it's awesome! Love it! Love it! Love it! The pillow with the buttons really caught my eye. 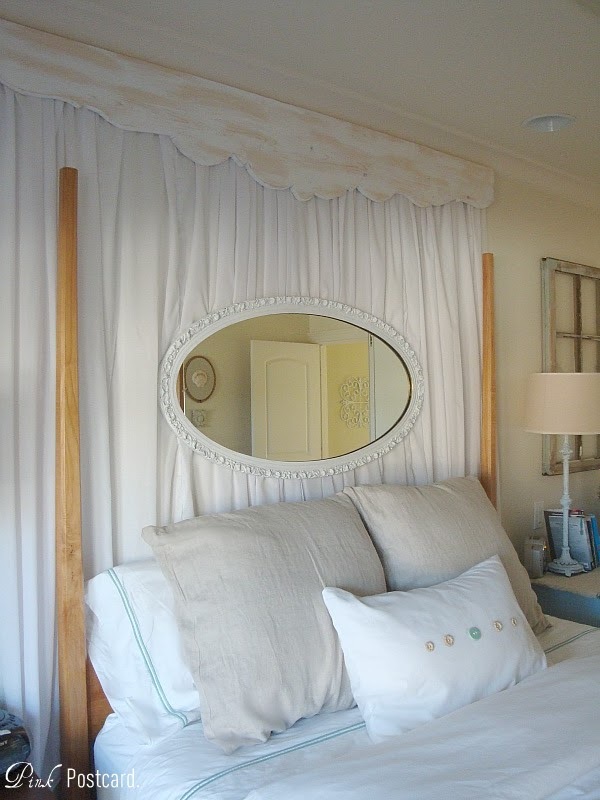 I also really like the mirror on the fabric behind the headboard. The room really does look like it was from a magazine! Great job! I enjoyed seeing the evolution of your bedroom. I love how it looks now! 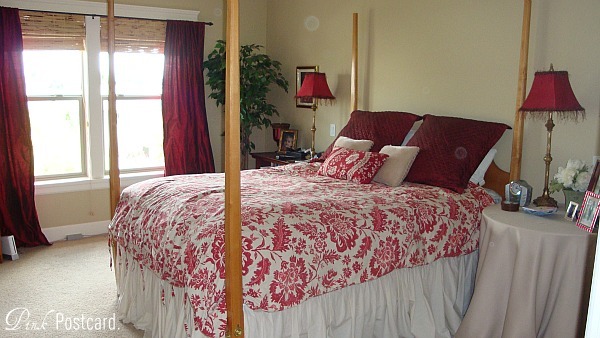 I really love the fabric hanging behind the bed, looks so comfy. 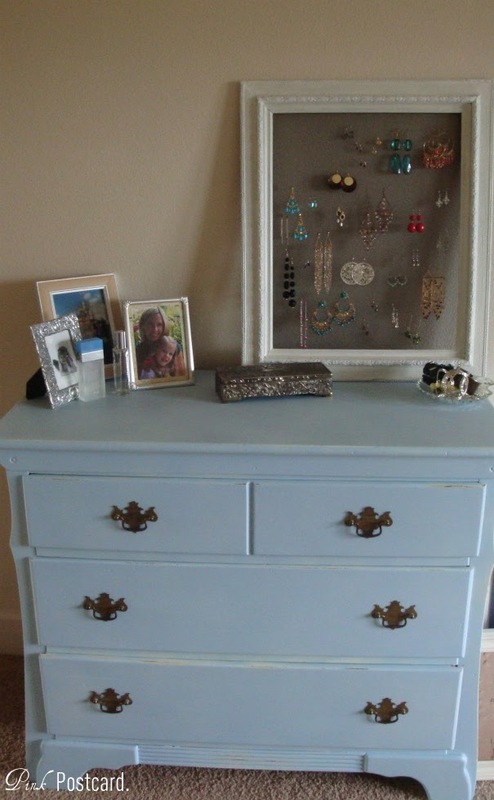 Also love the color of the dresser and the wood and sea glass. TFS! Well done! 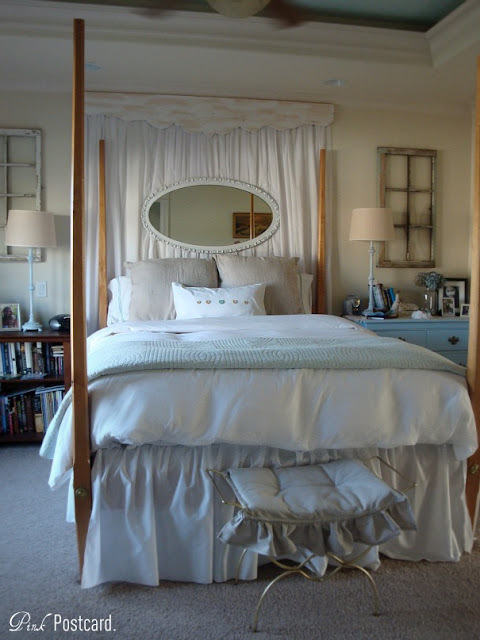 It's so soft and beautiful, the way a bedroom should feel. I love your accessories and I particularly love the fabric and cornice treatment behind your bed. A great focal point! I was going to ask you where you got that wall cornice and then I scrolled down and see you made it! Wonderful! 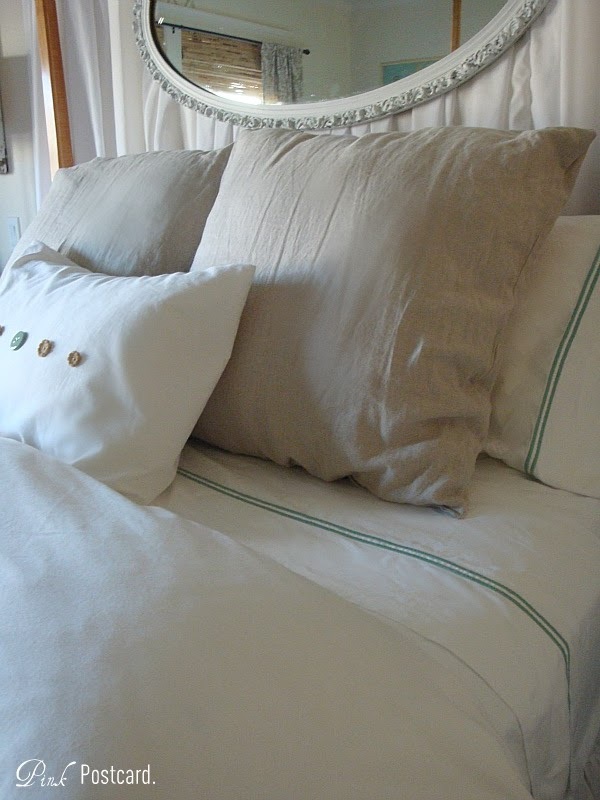 I love the softness the fabric adds behind the bed. 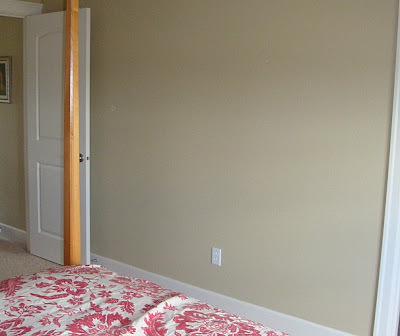 I want to do something like that in our new master bedroom, but I'm stuck on the cornice piece. 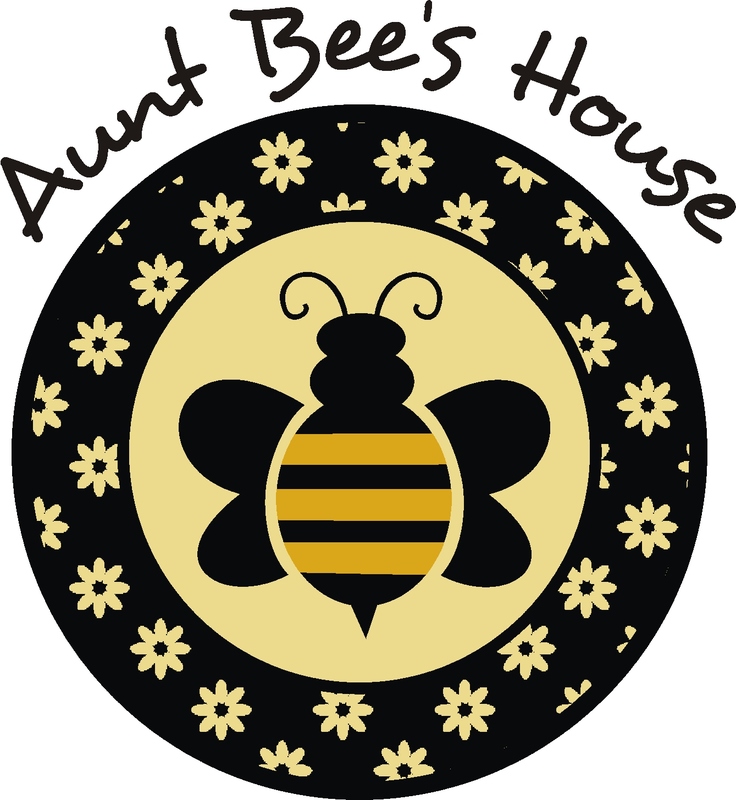 I'm hoping to find something at one of the thrift stores or the antique mart that I can use. 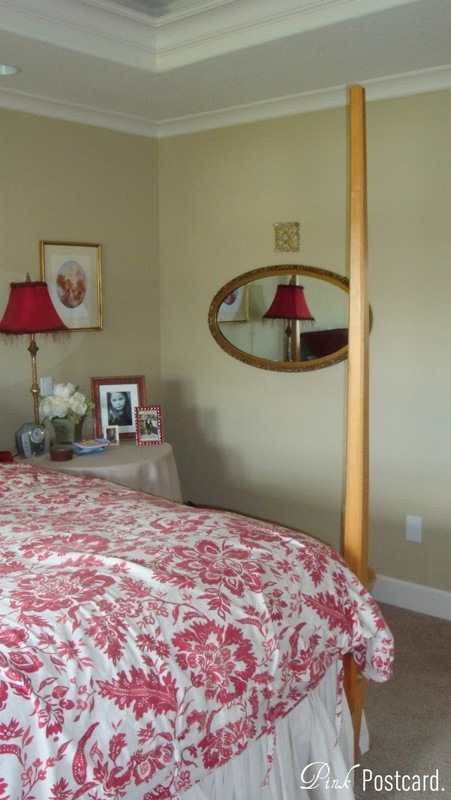 You did a beautiful job on this room! It's beautiful! This is my next project. You gave inspired me. Girl, you did a beautiful job on your room, I love the colors, very serene and peaceful and the touches of the sea are just enough and placed perfectly!! great job!! It looks great! I remember that room from Nate/Oprah. Everything you did looks really nice. And I love that everything was a 'deal' and doesn't look it! Wow. I adore the new and improved bedroom. I love how you showed us the stages of the transformation. This looks like a vacation suite! Beautiful!!! 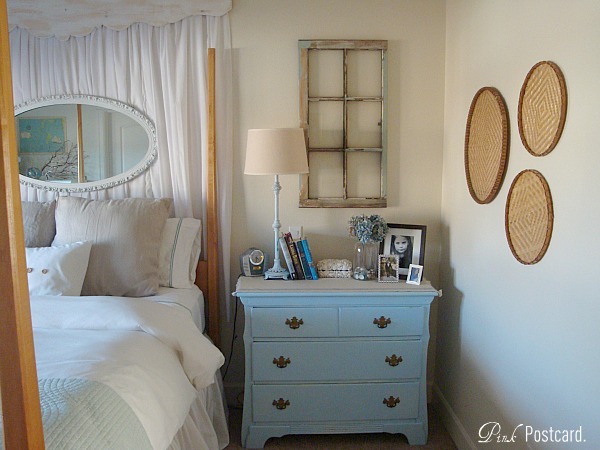 Love the beachy feel of the neutrals and the blues - so pretty and calming. I love your new bedroom. It was worth the time and effort that you put in. It's funny to me that your inspiration was a Nate Berkus room as I had his show playing while I am blog hopping!